After the twin bullet hells of Dai-Ou-Jou and Ketsui, CAVE returned in 2003 with their most accessible shooter yet. With its slow-down mode and guard barrier, Espgaluda is certainly a beginners game for most of its length, though it's true that the difficulty does jack up significantly near the end, providing a decent challenge to manic shooter veterans (at least for a short while, since there is no second loop). Espgaluda is ostensibly a prequel to 1998's Esprade, but the two games have very little in common, both in terms of setting and gameplay mechanics. Storywise, we are told that characters in both games have innate ESP (Extra Sensory Perception) abilities. But Rade takes place in 2018 Tokyo and Galuda in a fantasy land of medieval castles, so there doesn't seem to be any continuity between the characters and events in the two titles. Concerning play mechanics, the only feature carried over to Galuda from Rade is the guard barrier -- the rest of the system is brand-new. If CAVE eventually decides to release a sequel to Esprade, as many fans are hoping, they may well come up with an overarching plot connecting the two games but, until then, there's not much more to say on the subject. The game's system revolves around the so-called Kakusei mode, and is one of CAVE's most complex. In Espgaluda, apart from the standard power-up and life items, there are two kinds of items to collect: green gems (which are officially called Seireiseki), and Gold Ingots. Green gems can only be acquired when you are in normal mode ( i.e. not Kakusei). When destroying an enemy in normal mode these gems appear and are automatically collected by your character. By hitting the second button you switch to Kakusei. While in that mode, the enemies, their bullets, as well as the scrolling speed of the game itself, slow down to a crawl, while the player's speed remains unaffected. This effectively allows you to dance around thick bullet patterns with ease, and is the main reason for the game's accessibility. Now the second kind of collectable items, the Gold Ingots, are mainly acquired in Kakusei mode. If you destroy an enemy in that mode, all their bullets turn into Gold Ingots and are automatically collected. So what you must do is let the enemies spread a lot of bullets while you whittle down their strength, and then, just when they are about to explode, switch to Kakusei mode, blow them up, and collect the Gold Ingots. The more bullets on-screen when you destroy enemies in Kakusei, the higher your score multiplier, up to a maximum of 100 -- hence the game's scoring gimmick. However, you can't just stay in Kakusei forever, since while in that mode the number of green gems in your possession starts to decrease alarmingly fast. If you run out of gems bad things start happening: the enemy bullets will turn red and suddenly start raining down on you at impossibly fast speeds. This mode is called Kakusei Overmode, and should be avoided as it quickly results in death -- regardless of how experienced you might be. Finally, just as in Esprade, by pressing and holding the third button a green barrier is created around the character, making him (or her) invincible, which subsequently turns into a laser when you release the button. The longer the button is held, the bigger the barrier, and the more powerful the lasers that will be shot. In Kakusei mode you can still use the guard barrier but there is also an auto-barrier enabled, presumably to help you out in tough spots. This means that the guard barrier is automatically activated if you get hit by a bullet or collide with an enemy. The system might seem complex at first, and, well, it is, but it allows for great flexibility. You can milk the Kakusei mode to make the game easier; you can hone your technique to maximize the Gold Ingots (and therefore, your score); or you can do what I do and play the whole game in Kakusei Overmode -- impossibly difficult but also very exciting. Regardless, going for a high score is a lot of fun and extremely rewarding. It requires much practice, very good timing, and also some memorization, because you need to know when each enemy is about to die. The music is done by Manabu Namiki, who previously worked on the haunting DDP DOJ score. Who would have thought that fast electronic beats and dance music would work so well in a shooter set in a medieval fantasy world? It doesn't even matter whether you like dance music or not; the soundtrack fits perfectly with the Kakusei system, and you soon find yourself switching back and forth to the beat of the music, destroying hordes of enemies left and right, and filling the screen with an insane amount of gems, gold and score multipliers, wishing the stages would never end. 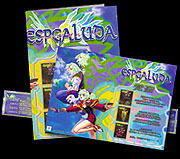 Espgaluda is another timeless classic by CAVE, fondly remembered by many fans, including myself, because it was the game that got them back into shooters. Try it out and see for yourself.